Lawrenceville is a small Illinois city that is found on the Embarras River and has a little more than 4,000 people that are proud to call it home. In this city, you will find modest homes, hard-working families, and great pride for the high school’s state champion basketball team! To help protect the people, homes, and businesses that are found in Lawrenceville from the damages and dangers of pests, trust the local pest control experts found at Action Pest Control. Action Pest Control offers affordable, comprehensive, and highly effective residential and commercial pest control programs. Don’t leave it up to chance whether or not your Lawrenceville property will be invaded by pests, be proactive and stop pests before they have the opportunity to damage your property, introduce diseases to your family or customers, and become a huge nuisance. Contact Action Pest Control today to learn about implementing a pest control program in your Lawrenceville home or business! To ensure that your family and property are being continuously protected from a wide variety of common household pests, choose one of Action Pest Control’s four year-round home pest control programs. Through any of our 4 programs, you will receive comprehensive pest control services that are completed by our highly trained, educated, experienced, and always friendly pest control experts. Our most inclusive year-round pest control option is our Premier pest control program. The Premier program protects your home from over 40 household pests, including stinging insects within 40 feet of the structure. 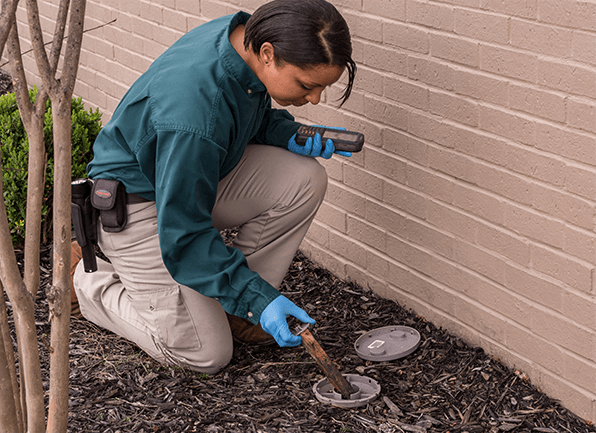 The Premier program also provides exterior pest defense and interior pest control services, cobweb removal, rodent control, window sill vacuuming, and many other services - including termite monitoring and termite inspection. To learn more about this program or our other three home pest control programs (Complete, Advanced, or Essential), give us a call today! Inspect your home’s foundation and seal any entry points found that black widow spiders could gain access to your home through. Keep wood piles up off of the ground and at least 20 feet from the exterior of your home. When working outside, wear gloves. Inspect outdoor furniture before sitting on it or moving it. Shake out clothing items and shoes before putting them on. Inspect boxes, bags and other items that have been untouched for some time before digging into them. Reduce piles of clutter in basements, closets and other storage areas that black widow spider could potentially use for hiding spots. If you have seen black widow spiders on your Lawrenceville property, contact the black widow spiders experts at Action Pest Control. We have the experience needed to find and eliminate these venomous spiders from your property. At Action Pest Control we rely heavily on the principles Integrated Pest Management (IPM) and our pest professionals to create an environment that pests aren’t attracted to and don’t want to live inside of! Contact us today to put into place a commercial pest management plan from Action Pest Control for your Lawrenceville business! If bed bugs ever enter into your Lawrenceville property have the peace of mind knowing that they can quickly be eliminated through our highly effective bed bug control services. At Action, we begin by having one of our bed bug dog detection teams perform a thorough inspection of your property. If adult bed bugs, eggs, or nymphs are discovered we highly recommend using heat to eliminate them from your property. Action’s eco-friendly heat remediation services provide the complete elimination of bed bugs from any property in (generally) just one treatment. But, before you can call us for help, first there are some things you need to know. Learning what bed bugs look like can assist you in getting the professional help that is needed to eliminate an infestation from your property as soon as possible. Adult bed bugs are the most easily identifiable stage of bed bug for home and business owners to identify. Before feeding adult bed bugs are a brownish-red color and are oval and flat in shape, they are wingless and have six legs. After having a blood meal their appearance will alter slightly, they become more reddish-purple in color, their body swells and becomes more elongated. If you ever discover bed bugs in your Lawrenceville property, contact Action Pest Control immediately. We have the industry-leading services needed to completely eliminate any bed bug infestation from any Lawrenceville property. Are Pest Birds A Problem For Your Business?